Trilogy of tragedy isn’t this time story-based map. Map point is only one and simple – kill enemy huge power core and protect your own power core. What makes this map very unique map is that it is 2v2v2 map. Now you need to get good teamwork together and make a plan. You better capture fast some expansion point for more money. 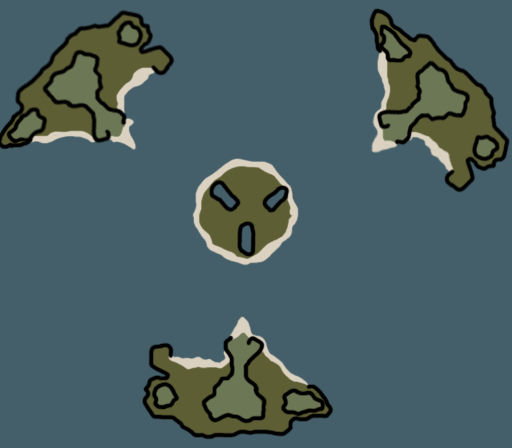 Even if you lose in capturing middle island – there is still island expansion points – get hold on these! But remember – strategy owns this map! This map design is based on Drummin's AOD map Dark Fortress for Generals ZH although I have changed the setting quite a lot. The fortress has been built in the area of an old and extinct volcanic eruption, which happened to appear above the surface of the sea. The action scenario is set at night. The Keep, in the centre of the map, is occupied by 2 co-operative players, whose task is to defend the position as best they can. Although the Keep looks a little cramped, there is ample building space on there to maintain a decent defence. Basic power requirements and static defences are granted to the 2 defending players at the beginning of the game, but you will need to maintain and defend those power installations, otherwise your defences are down and you are open to attack. In addition to Ore Nodes on the centre, there are Oil Derricks to supplement funding. The outer fortress has a symmetry and is occupied by the other 4 players, who have to destroy the central installation by working together as a team. Each outer position also has basic power requirements granted and some strategic defences, but the only income is from Ore Nodes only. The outer positions are built with a Naval Yard, situated in the specially protected areas next to the base. Superweapons are disabled, so you will need skill and strategy to create your forces and plan your attacks, whichever position or faction you choose. This is a mission map, you will play as the Empire of the Rising Sun against the Allies. It is a Co-op mission map, which is heavily reliant on teamwork. Without teamwork, you won't make it to the end. Be smart and lead the Empire to victory! Story: The Empire is losing territory, the allies are coming really close to winning this war! This may never happen! Take your commando, for a stealth attack in enemy territory. Plan an attack on the most heavily defended Allied prison, rescue the prisoners and destroy the enemy. Make one mistake...... And you will be dead! This map has real objectives and there are a lot of cinematics in it. It has 3 different difficulties: Easy, Normal and Hard. Easy is really easy, even beginners can get to the end! With Normal setting, you will need to use teamwork, it is not too hard, but not too easy either. If you can beat the map set on the Hard level, all I can say is that you are the expert. So there is a game setting to suit all levels of players. This is an expansion of my Ninja map Assassin's Shadows. A Place In The Heavens features a new and extended array of units to use including the Tankbusters, Engineers and the IFV Gunner. The aim of the map will be the same however, it contains extra bonus features, including Control Points and automated defenses. The game begins with a vote to see the intro. If more than 2 people press "Execute" then the intro will start. If you wait 30 seconds, then you are taken to the clan choice area. The Clan choice area is used to select the Clan for your units. This affects the outcome of your units as each Clan has unique benefits and fall backs. To pick a Clan, just select the unit that represents your clan choice. Traditional units are governed by the Shinobi and Technological units are governed by the Imperial Solider. Selecting a unit will give you a pop up box explaining to click the execute button to select the Clan in question. If you aren't sure which team you want, you can always select Yuriko who governs the random Clan option. Each Clan also have their highlights to help with your selection. Also note that both Clans use the dog unit. The main goal of the battle is to own all of the Outposts on the map. Each allied outpost is located either North, South, East or West and the Japanese Radars are found in the center of the map. Only a single player can own all of them to win. Should something be preventing you from claiming your Outposts then infiltrate your enemy's "Nano Tech structure" to kill them. You can ether infiltrate it twice or capture it with an engineer to kill them with one shot. Again, I recommend you play this in a FFA/No teams state and with other human commanders. You can also now call for "Higher tech" honours which are bestowed upon you if you hold and control 2 radar tech structures for 2.5 minutes, these include some of the strongest and tactically diverse units your production factories are capable of. This next map has been an idea I have toyed around with for a while. Its a 4 player map that requires a higher level of tactics to play. It has Ninjas ZOMG! The players on the map can have a choice of being in teams = 2v2, or have a "Free For All" match, any which way will require advanced Tactical thinking. Each player will start off in a corner of the map. They will have a Japanese Barracks which they can use to build either General Infantry and/or Ninjas/Shinobis to conquer your enemy. - Your funds can only reach a maximum of 5000 credits with a slow increase of credits over time. - Any enemy units that are inside the shield during activation period will be instantly killed, friendly units will be fine. This map has lots of cover, trick your enemy by sneaking past his/her army to take the barracks down. It is highly recommended that this map be played with other human Commanders. Fort Morgan was originally put forward as a suggested Red Alert 3 map by Nocturnal, a forum member on the EA main forums. Having looked at some aerial shots of the historic site in Alabama, I also thought that it could be a good scenario for a game map. 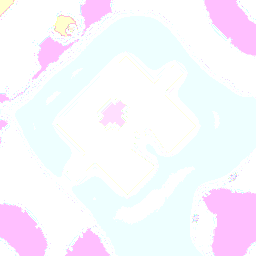 The Fort in the map has the main basic shape as the original structure, but the environment had to be changed to accommodate the game. With the additional scripting, the map is almost a mini-mission. In the centre of the Fort, there is an Academy, which when captured, hands control of the surrounding defences to the player who captures it. The Academy and Defences are indestructible, so players will have to find ways of re-taking the Academy. The Defences around the Academy are not accessible for garrison purposes, but need a lot of power (hint) so there is an extra neutral Allied power plant which is also handed to the capturing player. This is destructible, so it will be a loss from all player's assets once destroyed. I really hope you have great fun with this map.